Welcome to Hotel Castle Liebenstein, the highest castle in the Middle Rhine Valley in Germany! At our small family run hotel at Castle Liebenstein you can enjoy medieval ambience and travel back to the time of kings and knights. The Middle Rhine Valley in Germany, between Ruedesheim, Bingen and Koblenz, belongs to the most beautiful regions of Germany and is part of the UNESCO World Heritage. It's home to numerous sagas and has wittnessed centuries of German history. Come and experience the magical atmosphere high above the Rhine River and enjoy a unique time at Hotel Castle Liebenstein. Please note that Castle Liebenstein is closed for winter holidays from January 1 to April 14 2019. Your inquiries will be answered during this time. How about a very special gift? A voucher for a night on a castle hotel! 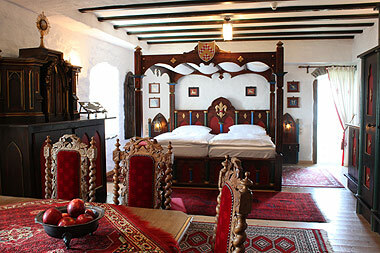 All hotel rooms are located within the old walls of Castle Liebenstein and are furnished in medieval style. Most of the hotel rooms offer a magnificent view over the Rhine River. The "Rheinsteig", one of the most beautiful hiking tracks in Germany runs right through the courtyard of Castle Liebenstein. Why not go for a hike? Indulge in romantic medieval athmosphere in our castle restaurant.